The mission of the Academy is to transform high-ability students with leadership potential into the business leaders of tomorrow by innovatively developing critical thinking, problem solving, technical knowledge, leadership and communication skills and connecting Academy students with leading employers. The Academy strives to enhance the national visibility and reputation of the College of Business by attracting the best students, equipping those students to successfully compete for jobs with top companies, and strengthening ties with employers and successful alumni. 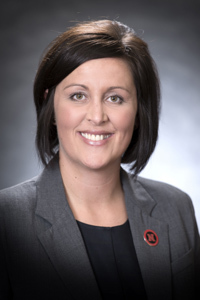 Erin Burnette is the Director of the Honors Academy and joined the Husker family in October 2012. She received her B.A. in Psychology from Truman State University and continued on for her M.Ed. in Higher Education and Student Affairs at the University of South Carolina. Erin has worked to develop and enhance the experience of college students in the areas of leadership programs, student involvement, undergraduate research, academic support and advising, and admissions and has also held positions with high school leadership programs at Brown University and Yale University. In her spare time, Erin is an active member of Launch Leadership, a youth leadership development non-profit in the Lincoln area. She lives in Lincoln with her husband, David. Additionally, Erin is a huge foodie and loves to travel and explore new restaurants and cuisines. Fun fact: Erin has visited over 150 college campuses! Becka Neary-DeLaPorte is the Assistant Director for the Honors Academy. She earned her B.A. in Journalism from Simpson College, her M.S. in College Student Personnel Administration from Illinois State University and earned her EdD in Adult and Higher Education Administration from the University of South Dakota. Her doctoral research explored the motivating factors which contributed to the recruitment and retention of faculty members serving as student organization advisors. 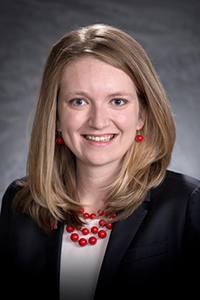 Prior to joining the University of Nebraska-Lincoln team Becka has spent her professional career working in the division of Student Affairs, helping promote student involvement, planning campus wide programming, facilitating leadership development opportunities and providing oversight to student organizations. Becka is excited for the transition into academic affairs and working with the Honors Academy students. Becka enjoys volunteering with her national sorority, swimming, traveling, and spending time with her husband, two dogs, and one year old twin boys (Avery and Elliot). Fun Fact: Becka worked on a Hawaiian cruise ship one summer while in college.